An ambitious listening tour is underway in DeKalb County School District (DCSD) to reinvigorate the role that parents and the community play in advising school leadership. The purpose of the tour, under the guidance of the DCSD School Governance department, is to gather parent and community input to inform the redesign of School Councils. The redesigned structure will allow Councils to have a clear focus on increasing community engagement and student achievement through transparent operations and shared best practices. The District’s goal is for each school to have an active School Council with elected members who have the training and support needed to operate in accordance with the District’s standards of good governance. “Parents and communities invest in their schools through a number of different ways,” said Laura Stowell, director of Charter Schools, School Governance and Flexibility. “By strengthening our School Councils, we are encouraging and supporting that vital investment and aligning with Dr. Green’s vision for “Building TRUST Together” throughout DCSD. The process began in fall 2016, when the School Governance department initiated the listening tour with a formal survey of principals and current School Council members. One-on-one interviews also took place with School Council chairs, regional superintendents, senior staff and community members. Most importantly, the School Governance team attended over 40 School Council meetings. “The knowledge gleaned from those face-to-face meetings yielded helpful insights,” Stowell said. In December and January, the School Governance team hit the road again, facilitating nine focus groups – free-flowing discussions using carefully-crafted guiding questions – with current School Council members from across the District. 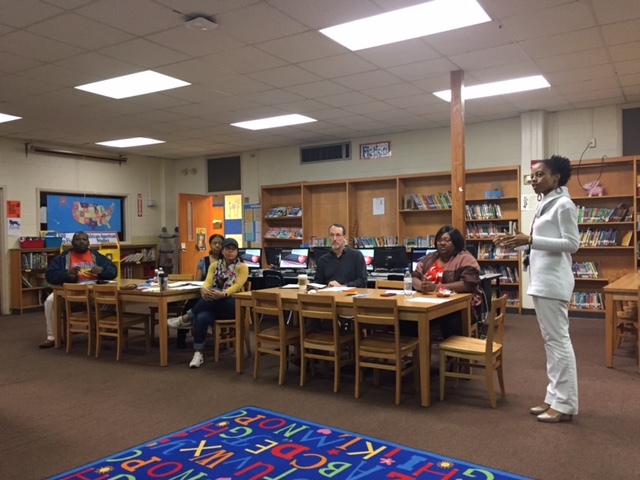 Hosted by Lakeside High, the Administrative Instructional Complex, Stephenson High and Columbia Elementary, these focus groups were organized by prioritized themes identified through the surveys and interviews—elections, bylaws, cross-council structure, and member training and support. In February, DCSD will host focus groups for the broader DeKalb community. Attendees will include leaders of community-based organizations, business partners and local government officials. If you would like to attend, please express your interest via email to the School Governance Liaison, Kina Champion, at Kina_Champion@dekalbschoolsga.org or contact the Charter School, School Governance and Flexibility team at 678.676.0718.